Head coach Doc Rivers of the Los Angeles Clippers during a game against the Oklahoma City Thunder on Feb. 8 at Chesapeake Energy Arena in Oklahoma City. 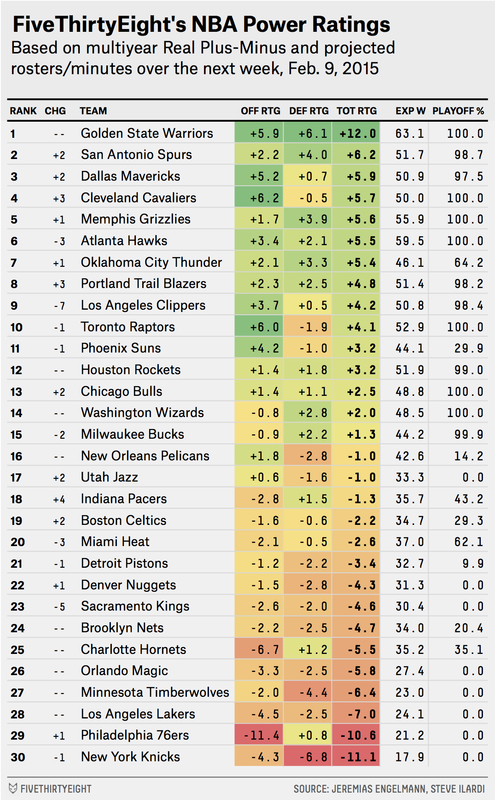 As we near the NBA All-Star break, it’s time to update FiveThirtyEight’s NBA Power Ratings. Here’s the short explanation: Teams are ranked according to a projection of their strength over the upcoming week using Real Plus-Minus (RPM) player ratings provided by Jeremias Engelmann and Steve Ilardi. For a more detailed FAQ regarding these numbers, see our introductory rankings post. The Los Angeles Clippers dropped seven spots in the rankings, and it’s not hard to see why. Since last Monday, they’ve gone 0-4 with an abysmal -13.7 efficiency differential, including a league-worst defensive rating of 121.1. (Granted, they faced the teams that were ranked No. 7, No. 8 and No. 9 in last week’s ratings, all on the road, but -13.7 is still disappointing for a team we’d ranked No. 2 overall a week ago.) Adding injury to insult, All-Star Blake Griffin is out indefinitely with an elbow infection, joining Glen Davis and sharpshooter J.J. Redick on the bench. The resulting lineup shuffling is expected to cost L.A. more than 3 points of power rating, even without considering their slide in play over the past week. On Friday night, the Atlanta Hawks won what was billed as a potential NBA Finals preview, beating the top-ranked Warriors 124-116. Yet in this week’s rankings, they Hawks have dropped three slots! What gives? Some of it was disappointing results offsetting that big win: Atlanta was outscored by 1.1 points per 100 possessions last week, including a 15-point loss to the New Orleans Pelicans (ranked No. 16 in last week’s ratings). But that had just a minor effect, considering Atlanta’s schedule difficulty otherwise. Instead, the biggest reason for the change is the allocation of more minutes to Kent Bazemore (who carries a very poor -4.4 RPM rating) after injuries to Thabo Sefolosha and DeMarre Carroll. Before Jan. 30, Bazemore was averaging just 11.8 minutes per game; ever since, he’s logging 29.4 MPG. No team’s rating improved more than the Portland Trail Blazers’ over the past week, and their ranking rose from No. 11 to No. 8. The team went 3-1 with a +6.0 point differential per 100 possessions since last Monday, with impressive wins over Phoenix and Houston. Portland was lifted by the return of Robin Lopez, who carries a +1.1 rating, from a broken hand. We’d projected him to record only 7.2 MPG last week, but he averaged 31.0 MPG instead, an uptick in playing time that alone is worth +0.6 of Portland’s 2.2-point rating improvement this week. Time to check in again on the playoff battle between the Oklahoma City Thunder and the Phoenix Suns. OKC seems to have righted the ship a bit by going 3-1 over the past week, increasing its playoff chances by 10.7 percentage points to 64.2 percent. The Thunder were aided in that department by Phoenix’s 1-3 record over the same span, which included a painful buzzer-beating loss to Sacramento. Despite still clinging to the No. 8 spot in the West, the Suns are suddenly staring at a 29.9 percent chance of making the playoffs according to our simulations — down a whopping 20.2 percentage points from a week ago. After winning all three of their games — which included handing the Cleveland Cavaliers what’s now looking like an extremely rare loss — the Indiana Pacers tacked on 25.6 percentage points to their playoff probability, which is now 43.2 percent. With George Hill’s minute limit now lifted, the Pacers could be poised to build on their recent improved play. At the same time, Miami’s postseason probability, once so positive (it stood at 93 percent last week), took a turn for the worse this week. An 0-3 record with a -11.6 efficiency margin can do that, but the more troubling development might be the recent injury to center Hassan Whiteside. (No, I never expected to type those words, either.) Whiteside owns one of the highest short-term RPM ratings in the entire NBA, thanks in part to an impressive run over his last 18 games, in which he’s averaging a double-double. The expected downturn in Whiteside’s playing time knocked 0.9 points off of Miami’s rating this week. The good news, however, is that Miami still holds the 8th spot in the East and our simulations show a 62.1 percent chance that the Heat make the playoffs. The Detroit Pistons were 18-30 a week ago, but somehow had a 33.8 percent chance of making the playoffs in the East. Now, not so much: Their chances have dropped by 23.9 percentage points this week, despite arguably improved play (they went 2-2 with a +3.0 efficiency margin, although they did also lose by 11 to the Timberwolves at home). One problem is Indiana’s aforementioned improvement, but another might simply be more teams crowding the East playoff picture. With about 30 games left in the season, Charlotte and Brooklyn spent the week solidifying their positions above Detroit in the standings, while even Boston is now creeping up on the Pistons from below. The Celtics went 3-1 last week and raised their playoff probability by 12.1 percentage points (partly because of the ascension of Marcus Smart to their starting lineup).